YES! More of the same encouragement to get to know the Lord you'll find in the first book. More of the same amazing real-life stories told by women who generously wanted to help you. More of the same sound Scripture-based advice for shepherding young adults through the college years. 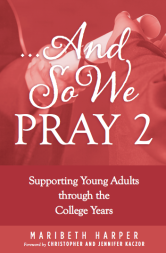 In this edition, author Maribeth Harper addresses many more "hot-button" topics college-aged young adults face and helps parents to navigate those challenging circumstances with truths from the Catholic faith. "Both of my books are full of personal stories shared with me by generous Christian women who struggled in one way or another with their child's college years. For each situation they described, I turned to Scripture and the teaching of the Catholic Church to offer moms with lots of practical, relevant help. Each chapter includes personal stories, an application of Church teaching, a prayer, and follow up Scriptures on the theme for further recollection or journaling. The books are ideal for small groups of Praying College Moms but I have also heard from moms who have just picked it up, and read it slowly and prayerfully! (And some read it in one sitting, too).